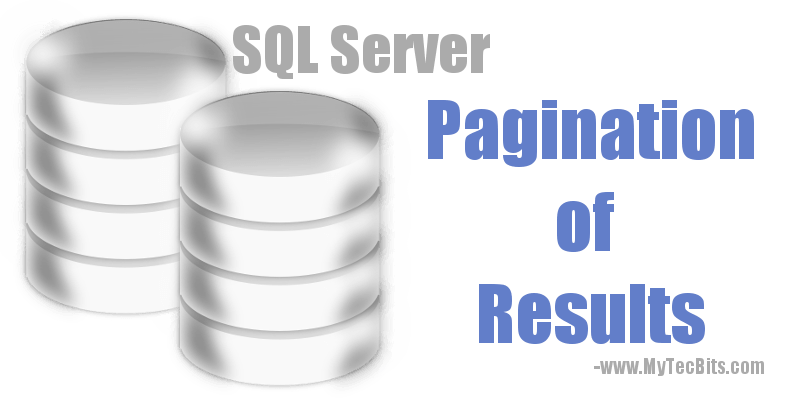 Pagination of results from a select statement is vital in SQL server programming. Nowadays web apps are becoming the preferred interface even for enterprise application. Delivering only the least required data to the user interface is one among the vital criteria for improving the performance of web app or even client-server application. Pagination will help you to retrieve the minimum required rows from a select statement to be displayed in the user interface. Only when the user needs to see more data, they can navigate to the further pages of result reducing the load on the server as well as improving the speed of the user interface. Here are the pagination methods, I’ve used so far. In SQL Server 2012 and higher versions you can use the OFFSET-FETCH clause to fetch only a part or page of result returned by the select query. As an input you have to give the number of rows per page and the page number you want to retrieve. For this first you have to find the number of records in the result set. Form that you can find the number of pages and the page number you want to retrieve. Here is a simple example to do pagination of results in SQL server for a select statement SELECT * FROM Sales.Orders ORDER BY OrderID. Step 2: Retrieve a specific page of result. After identifying the total number of pages available in the result set, you can use the below query to fetch the exact page from the result set using the OFFSET – FETCH clause. SQL Server versions older then 2012 does not have OFFSET-FETCH class. So you have to use the ROW_NUMBER() method to navigate through the range of rows. Here is a simple example of pagination of statement SELECT * FROM Sales.Orders ORDER BY OrderID on SQL server 2005, 2008 and 2008 R2. The first thing you have to do is to find the total number of rows. Use the COUNT() to get the number of rows in the result set. Ways to paginate results in SQL Server @ stackoverflow. ← How to get Date from DateTime data type in SQL Server?